So I modified my Shovell code to use unobtrusive jQuery. It works. # The following would work too. # Rails uses the HTTP Accept header to determine the request type. It was easier than I thought. It took me 3 minutes to figure things out. This demo page on the jQuery UI website was useful. I am so dumb: I should have referred to it when figuring out how to code my effect. If I feel lazy, I guess I can use RJS. 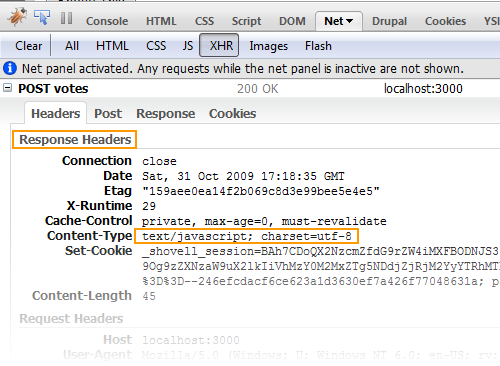 Of course, one can make his jQuery unobtrusive and still use RJS templates. As long as you don't use form_remote_for, form_remote_tag, link_to_remote and periodically_call_remote helpers, but add event handlers to application.js instead, then you're good. Ruby on Rails is awesome and all, but I was a little overwhelmed when I started. I then moved on to just Ruby and converted my Drupal site to Octopress. I may go back to Drupal but only if I want to actually build an application with it rather than just a website.